Spears that can directly attack opponents through their troops.To see the other types of swords, click here. Armor-Piercing Attack: Yari are the only swords to have a vertical range, meaning that they can pierce through enemy troops and damage enemies directly instead of having to destroy the troops first like all other swords. Chromatic Arrangement: The red, green and blue combination represented by Tonbokiri, Otegine and Nihongou, respectively. Difficult, but Awesome: On top of being one of the harder types of swords to get, they have a slower growth rate than tachi and can take a lot of resources to repair, making them unwieldy for starting players. However, at higher levels they can one-shot the notorious high-mobility yari right through its troops found on later maps in the game. Japanese Spirit: Each of the yari represent one of the three virtues, which is appropriate as they as a group are a symbol of Japan. Power Trio: So far, the three known yari are grouped together as Three Great Spears of Japan. Rare Random Drop: One of the rarest types of blade available. Red Eyes, Take Warning: A trait they all share is some hint of red color in their eyes, and they're quite deadly when trained up. Tonbokiri has reddish pupils, Otegine's eyes have a red tone to them, and Nihongou's appear to turn red in his Awakening portrait. "I have presently hastened to join you. You may call me Tonbokiri. I am prepared for battle at any time." The spear said to be wielded by the undefeated Sengoku general Honda Tadakatsu. His name comes from the legend that the spear is so sharp a dragonfly was cut in half only for landing on the blade. He's serious, but polite and considerate off the battlefield. Animal Motifs: It's a given with his backstory that he's both named after and associated with dragonflies. Big Brother Instinct: Towards Sengo Muramusa, since they both come from the same clan and he does care and worry about him deeply. Badass Baritone: Has one of the deepest voices out of the cast. Amusingly, he shares his voice actor with Doudanuki and Yamabushi, but he can keep it appropriately at an indoor volume...until you take him to the front lines. Badass Boast: Has a few, keeping in theme with his legend or his untouchable owner. "What's wrong? Unable to approach me?" Beware the Nice Ones: While he's pleasant at the citadel, he's nothing short of fierce in battle, likely from his master's influence. "Shut up and get sliced in half!" Gentle Giant: Extremely polite and docile towards the Saniwa at the Citadel, to the point of making an effort to not trouble them. He also gets along with the horses, something uncommon among the larger swords. In his first appearance in Touken Ranbu - Hanamaru, he's even reading a picture book to Gokotai. Mihotose has him take care of Ieyasu while still keeping good physical form. Just look at him trying to cheer the baby up while training at the same time. Hunk: Being the most visibly muscular of the characters and looking more handsome than pretty, he fits squarely into this trope. Hot Blooded Sideburns: They help set his appearance as older-looking than most swords. While not as hotblooded as other characters, but he's not shy about his battle prowess. Insanity Immunity: Notable in that he's very level-headed despite being a blade forged by Muramasa, blades of whom are notorious for driving their owners mad and to suicide. He even lampshades it by saying that Muramasa wasn't an evil person. 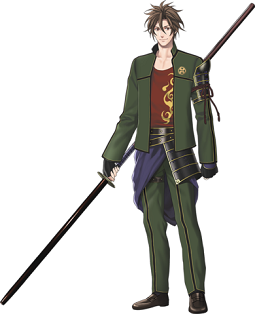 Japanese Spirit: Of the three, he represents chie or unshakable resolve; he's one of swords most devoted to the Saniwa's needs and enjoys battle for the sake of success rather than just fighting. Mighty Glacier: High offensive and defensive stats, but very slow. This actually works in his favor, because the tougher enemies like high-level yari are usually the ones left standing for him to strike down. One-Man Army: Mihotose no Komoriuta has Tonbo mow down 10,000 enemy soldiers by himself during war. The dude's a beast. Only a Flesh Wound: Some of his injured lines have this effect. Sarashi: Wears the male version of this, which is clearly visible since his clothes are open. The Southpaw: The way he wields his spear in his battle sprites and the Mihotose musical would indicate he's left-handed (the dominant hand is held at the bottom to better control strikes). In Katsugeki, however, he uses his right hand. 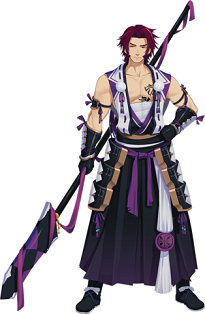 Stripperiffic: In relation to the rest of the swords, his default outfit is this, even prior to Awakening; his shirt and jacket are sleeveless and open on the front and sides with just sarashi underneath. In a stark contrast, his casual clothes are very modest. "Despite being called flawless...invincible...we did not proceed...? Please forgive me, for passing away so early..."
Sweet Tooth: This is hinted at in the game, since in his fatigue recovery line he mentions that he's a bit weak for sweets. In Katsugeki, he becomes very fond of daifuku since it was the first thing he ate after being summoned. Trademark Favorite Food: At least in Katsugeki, he takes a particular liking to daifuku since it was the first thing he consumed after emerging as a Touken Danshi. His unit members take careful note of this in later scenes. "One of the world's three great spears. Otegine. I can't do stuff like slicing or knocking down enemies but I won't lose if it's stabbing them!" A spear commissioned for Yuuki Harutomo, which was designed for piercing enemies rather than slashing due to its long, heavy blade. Even then, it became more of a clan symbol during ceremonial processions. 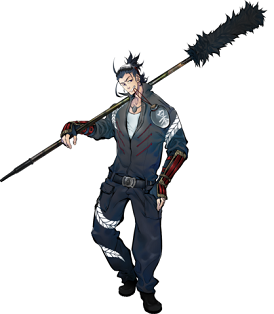 Otegine is a casual, though critical, person who doesn't think much of himself because he is the least renowned of the Three Great Spears. Always Someone Better: Even as he gets stronger, he feels that can't compare to the other two Great Spears. Blood Knight: More subtle compared to, say, Doudanuki, but he is rather excited when you send him into combat. Curtains Match the Window: Narrowly averted. His eyes are a warmer shade of brown than his hair, and in some cases they appear to be a dull red. Dumb Muscle: Otegine often claims to be good at nothing except piercing, and will use it as an excuse in his complaint if you send him to work in the field. Japanese Spirit: Of the three, he represents seishin or persistent willpower; he wants to improve himself despite his low confidence. Master of None: Though his stats are relatively balanced compared to the other yari, they never beat out Tonbokiri or Nihongou's as the highest, with the exception of his unusually high Scouting stat. Muscles Are Meaningless: Despite his leaner build, the Otegine spear is the one of the heaviest weapons out of the cast despite how effortlessly he wields it, hinting him to be stronger than he looks. In one Hanamaru episode it's lampshaded, and he's able to have both Nihongou and Tonbokiri stand on his shoulders. Nice Guy: Word of God says he's this behind his attitude and is good friends with the wakizashi. One official artwork has him even enjoying a picnic with the contrary tantou Fudou. Sad Clown: Many fans find his lines entertaining when set as the secretary, since he tends to complain or respond incredulously to the Saniwa's orders. However, he's shown to have some genuine self-confidence issues as the least renowned out of the Three Great Spears and being used more for ceremonies than actual battle. He was also melted in a fire to the point of being irreparable, making him the only one of the three spears to no longer exist in the present day. Shaped Like Itself: His name came from his original scabbard, which was shaped like a Japanese "kine" pestle. When the Tokugawa Shogunate's Sankin-Kotai was implemented, Otegine was fitted onto an over-sized and exaggerated version of his old scabbard for ceremonial processions. He comments on it not being an enjoyable experience. Trauma-Induced Amnesia: He was destroyed in a firebombing raid during the Pacific War, but seems to have no recollection of it. In a removed line, he would mention having bad dreams. You Can't Fight Fate: His line if he's destroyed, based on his destruction in real life. "I had a vague idea it'd end up like this... well, this, too, is fate, huh..."
"I'm the best spear in Japan, Nihongou. I'm barging in. So, how many cups did you drink before I arrived?" A spear owned by the Kuroda Clan, who won him when his previous owner lost a drinking gamenote In history and fiction, it would be the senior Kuroda vassal Mori Tomonobu (Tahei), who fought Fukushima Masanori in a drinking game and won. He's a heavy drinker who loves sake and is usually laid back, but is also very prideful. The Alcoholic: Like Jiroutachi, he really likes his sake and constantly has a gourd of it with him. Unlike Jiroutachi, he's more laid back about it. His constant drinking is a reference to how one of his former masters, Fukushima Masanori, lost him to the Kuroda clan in a drinking game. Berserk Button: Do not dismiss the Kuroda family. Hasebe never talked about them in the citadel and Nihongou considered snapping him in half for saying that because he presumed that Hasebe didn't care about them. Friend to All Children: Word of God says he gets along well with the tantous owned by the Kuroda clan. Goggles Do Nothing: Wears a pair of goggles on his head that don't serve much purpose other than to look cool. Hidden Depths: Despite his smug and boisterous attitude, he genuinely holds the Kuroda family in high regard. While he taunts Hasebe in their first recollection, in the second he seems to want Hasebe to move on from his grudges to be happier. Japanese Spirit: Of the three, he represents koyuu, or natural talent; he's very aware that he's a highly treasured and powerful spear. Kaleidoscope Eyes: His eye color actually changes depending on his portrait; his default and internal affairs portraits give him blue eyes, his action portraits give him brown eyes, and his Awakening portrait gives him red eyes. This is based on his spear's shaft having an inlaid mosaic of blue, brown, and red. In Hanamaru, they're even purple. Lightning Bruiser: Considerably faster than Tonbokiri and stronger than Otegine. Perma-Stubble: Adds to his rugged and manly appearance. Rare Random Drop: As an uncraftable sword, he was initially only available as an extremely rare drop on the boss node of the last stage of the August 2015 event. He was later added to the main game in the update which introduced level 6-4, in which he's available as a drop on the boss node, though of course still an extremely rare one. Smug Super: Other than being an alcoholic, he would like to remind you that he really is the best spear in Japan and is part of the imperial collection. In his recollection with Hasebe, he's even more smug about it and calls Hasebe "a lowly sword tailing on his master's coat", referencing that in the past, Nihongou's owner was the subordinate of Hasebe's owner, but in modern days, Nihongou's rank as part of the imperial collection is higher than Hasebe's as a national treasure. Why Did It Have to Be Snakes? : In Hanamaru, he reveals that he's afraid of tigers (even Gokotai's tiger cubs! ), because his former master Fukushima Masanori had a run-in with one.